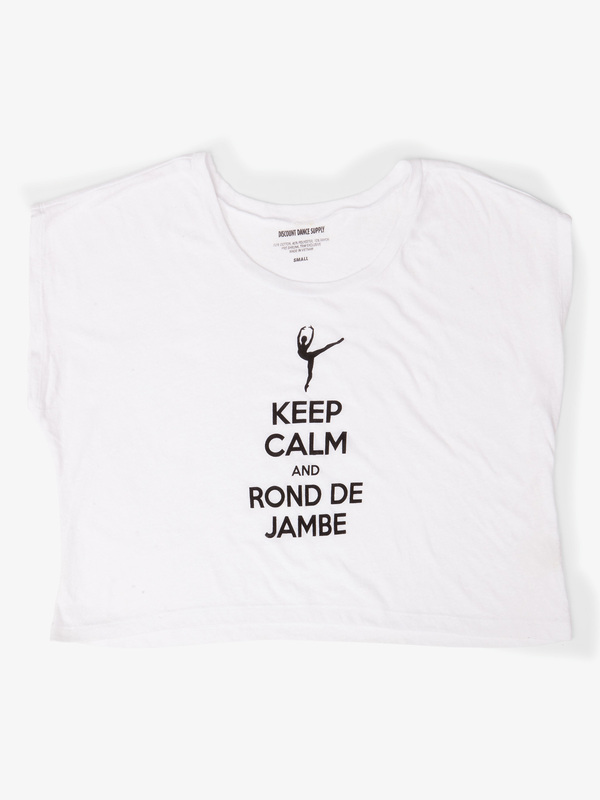 Our amazingly cool "Keep Calm and Rond de Jambe" graphic tee was designed with input directly from YOU! Thanks to all our Facebook fans who cast their vote for the dancer silhouette featured on the shirt. With it's lightweight breathable fabric and relaxed fit, this is the perfect comfy tee for rehearsal, class, and practice...or wearing out on the street! This top is darling! Yes,it does look "boxy" and cropped. But, that is the style. PLEASE try this on first before judging it! I bought this for wearing out and about and not for ballet practice,but may wear tomorrow for warm up to see how it moves/fits while practicing. Glad I got my usual size M and not the L. As, I'm sure, it would've been too big! I tried it on over a cami I was wearing, and it looks super cute! It's very soft and fits better than I thought it would! Highly recommend! I also love the sleeves! It's a very updated "slouchy" look! The first photo is very misleading. This is a crop top. I was very excited to receive this shirt in the mail! It looked to be the perfect size, but after I washed it it shrunk up in it's length and not the width. I am 5' 9" so the shirt looks like a crop top. I do still like the shirt, but like I said, it is more like a crop top than a t-shirt. This shirt is incredibly comfortable, very soft and looks adorable on. I am 5'5" 118lbs and I usually wear a size small in shirts but, I bought the gray in Medium and it was perfectly baggy and slightly off the shoulder which is what I was looking for. I could wear this out and about or lounge around the house with it. I also received tons of compliments, everyone adored it. My biggest complaint would be after just one wash, all of the letters completely faded. I don't know if I would recommend this to a friend, maybe if you just hand wash it you might have a better shot of it not fading. Still very comfortable overall. In the picture it appears to be a regular length tee, but in actuality it is a very wide (I bought a small, 132lbs, 5'7") and very very square. 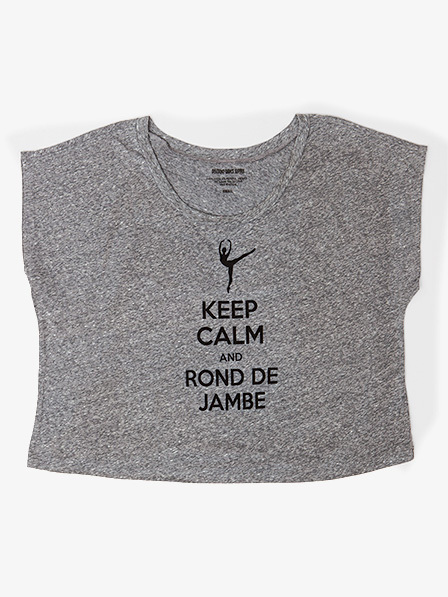 This should be a hip hop style crop top, not for ballet. It doesn't stay on the shoulders and is so wide it's not even good to tie. I'll be giving this one away. I love the style and neckline. I should have ordered this item smaller it tend to run on the large side. I wanted to to run bigger to move it but it's a little sloppy so I think the manufacturer already factored this into the sizing. Otherwise I love the look of this shirt. I love love love this shirt... and everyone loved it when I wore it. My only complaint is after only one wash the words faded so much that they weren't even black anymore, so they didn't stick out. One person even thought maybe I had gotten a different shirt. Other than that it's super comfortable and super cute. I am going to get one for my friend as a gift but in white so if the words fade it won't be as big of a deal because the greys won't blend together. The t shirt is a very nice shade of darkish grey. The fit is true to size. I am 5"4, 110 and I bought a small. It's slouchy and wide but it's supposed to be for the look. I am very happy with this product. I am a 5'2" ballet instructor. I love this cute top! Fits well and is very soft/comfortable. My students will get a kick out of it! I wore this shirt to dance and everyone loved it!!! Plus it's so soft and comfy to dance in or just wear around!!! I am 5'4", size small street clothes, size medium in many dance clothes and I purchased this top in Medium...it's perfect. Light, loose, soft, comfortable and in size M for me slightly off the shoulder for that 80's look!! Yes, it's a little short with large sleeve holes but that's the style...very cute, glad I have it. This shirt was so cute, and I couldn't wait to order it for teaching and dancing. It is a little shorter than I thought it would be, but since I'm wearing it over a leotard, it's not a problem. It is now my favorite shirt. Love the sentiment, the feel of the shirt and the look of the shirt. I didn't see a size chart. Just wondering how the fit of this shirt was. Thanks! The size chart for this item is... small medium large extra-large Bust 32"-34" 34"-37" 37"-39" 39"-41" Waist 24"-26" 26"-28" 28"-30" 30"-32" Girth 54"-58" 58"-61" 61"-63" 63"-65"
Unfortunately this t-shirt is not available to be custom screen printed.